This is a build generated primarily with HC in mind. It stacks INT, makes use of the Hand of Wisdom and Action claws for DPS, uses ES and the ES% bonus from INT as the primary form of Defence and neutralises the traditional weaknesses of CI by taking Unwavering Stance as well as Raider's Avatar of the Veil to be immune to both stun and elemental status ailments. It is slightly different from the other HoWA Raider builds in that it picks up US and also because it is primarily a Crit-based build, as opposed to simply being an Elemental Overload-based build. 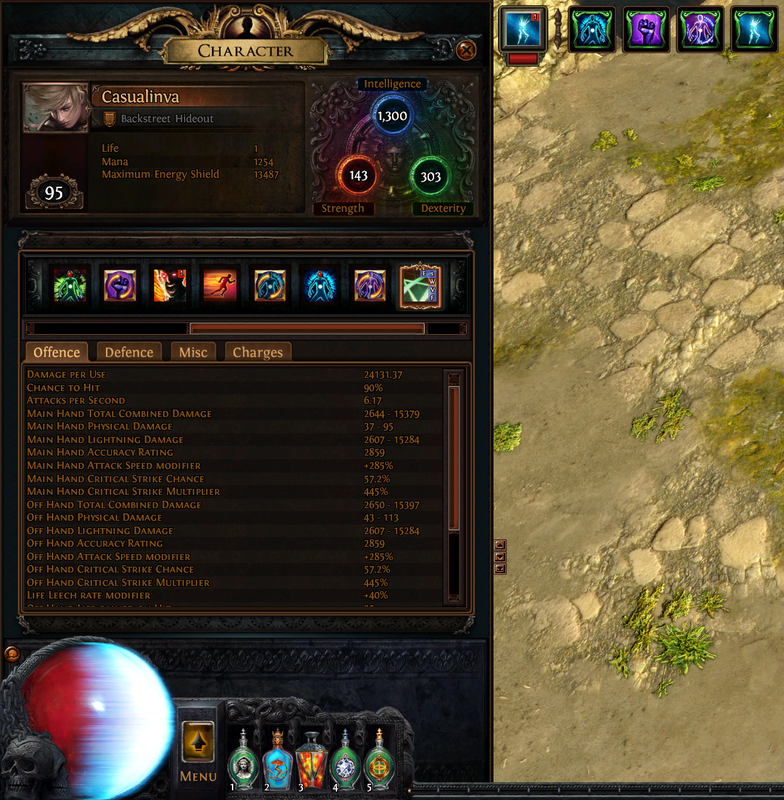 We do however make use of the Elemental Overload keystone while leveling because it adds free DPS. It is a placeholder keystone, not an end-game keystone. Because crit if built right is going to be better than the Elemental Overload keystone. Also, investing in crit isn't actually that expensive considering the pathing of this build, where most if not all the crit nodes are just adjacent to the main tree and really the only crit mods you need on gear is crit multi on amulet/jewels. Non-crit raider is easy to build because you have fewer mods on gear to have to worry about, but that also means that you reach your dps output ceiling much earlier. All of the above will start providing diminishing returns at some point. 1. If you have 500 int, stacking another 100 int is effectively a 20% damage boost. If you already have 1000 int, stacking another 100 int is only a 10% damage boost. 2. Let's assume your average damage is 8000 and your attack speed modifier is 50%. As a dual-wielding HoWA, your APS would be 1.6 * 1.5 * 1.1 (DW) * 1.6 (BF) = 4.224 APS, which would translate to 4.224 * 8000 = 33,792 DPS. Stacking on another 50% attack speed would put your new APS at 5.632 and DPS at 45,056 which is a 33% damage boost. Were you to stack on another 50% attack speed however, your new APS would be at 7.04, DPS at 56,320 which is now only a 25% damage boost from before. Considering most raider builds have no problems stacking at least 150% attack speed modifier from gems/jewels/tree, you can therefore see that just focusing on stacking attack speed alone when your attack speed is already so high is also not going to be as rewarding. 3. Most non-crit builds will be hard-put trying to stack >100% lightning/elemental damage modifiers on the tree as compared to their crit counterparts. The significance of this 100% becomes less when you consider opal rings as well as the abundance of %WED mods on gear. Also, by going non-crit and grabbing elemental overload, you render an entire set of mods (ie crit chance/crit multiplier) on gear/jewels largely irrelevant to yourself. Crit builds have the above to stack up on but also have the additional crit chance/multi modifiers to build up once the above-mentioned (%damage, attack speed, INT) start providing non-optimum returns. 40% more modifier on your damage is great, but it actually provides marginally less extra %damage modifier as someone with 35% crit chance and only 220% (baseline is 150%) crit multiplier, which now that I put it this way, doesn't sound all that impressive does it? --> 0.35 * 2.2 + 0.65 = 1.42. If you're the kind of player who likes investing in his character, I'd still advise you to go crit eventually, because even though its tougher to gear, its not tougher without being rewarding. By going non-crit permanently, you'll find it easier to gear not because its more powerful but because you're forced to ignore alot of other mods and its therefore easier because there're lesser things to consider when gearing your char! For crit gearing requirements, you essentially only need crit multi on an ammy and on your jewels. Everything else remains the same as non-crit. The tree will of course be different, but because elemental overload is likely not going to be far from your path, you can still pick that during the leveling process and respec from it later on when you've got the right gear + enough crit nodes. ST > BF in open spaces/outdoor maps because of larger AoE/screen coverage. Not much difference in indoor maps. BF >> ST. BF definitely does alot more damage compared to ST. This is more apparent when fighting high HP unique bosses. However, this also means that reflect can be a bigger problem for BF as compared to ST.
BF >> ST. BF hits instantaneously. For ST you need to wait till your projectiles hit the enemy before you can leech. Granted, its just a split second difference, but that split second difference can be dangerous when you're down to 20% ES. ST >>> BF. ST's mana cost is hideous. BF's low mana cost makes it much easier to spam especially during the early leveling period. BF >> ST. ST just requires spamming. BF requires interval release every time you reach maximum stacks in order to get maximum dps out of it, so it is in a way a tougher ability to use. Check the BF versus ST video in the video section, it might be helpful! It really is up to you. I personally prefer BF because it feels more satisfying and robust. Then again, I do not have the ST microtransaction so that might explain why the skill doesn't appeal to me. Why Unwavering Stance? Is it really necessary? In SC? Of course not. Anything goes in SC. That said, having stun immunity improves your gameplay experience tremendously. In addition, it frees up flask slots for more DPS. In HC, take it from a HC CI veteran, it is definitely necessary. True, you can try your luck and be careful to avoid getting stunlocked by ranged mobs. However, HC is all about minimising chance of death. No matter how careful you are, all it takes is that one moment of non-concentration or bad luck and that's you dead because you couldn't whirl away in time due to being stun-locked. Does more INT = better? Yes, but only to a certain extent in terms of offensive utiliy. Stacking INT provides diminishing returns as your INT gets higher, especially when you have a limited number of skill points and the presence of %elemental damage nodes. To provide a simplified example: if you have only 100 Int, grabbing another 10 Int will increase your final DPS by 10%. However, if you already have 1000 Int, grabbing another 10 Int will only increase your final DPS by 1%, and will be inferior to a 10% elememtal/lightning damage node for instance as that particular node will increase your total DPS by 10% of your base damage, which will likely ultimately be >1% of your final DPS. Elemental reflect is a killer, no doubt about it. The higher your DPS, the more trouble it'll give you. It's still manageable in solo play when monsters' HP is low, as you can see from the chimera fight video I provided, but it'll definitely be difficult to deal with in party play when monsters' HP is scaled up. There's no real work-around aside from deliberately gimping your DPS, but its worth it to do so if it means that you don't die an embarrassing death when mapping with your friends. Elemental reflect maps: Replace WED with life leech and drop wrath for purity of lightning. To be even more safe, replace immortal call (linked with CWDT) with Warlord's Mark instead. Solo Play: Judge for yourself the balance between your DPS and ES. If your DPS is too high for your ES to handle reflect, consider getting better ES gear or just dropping wrath for purity of lightning until you get upgrades. 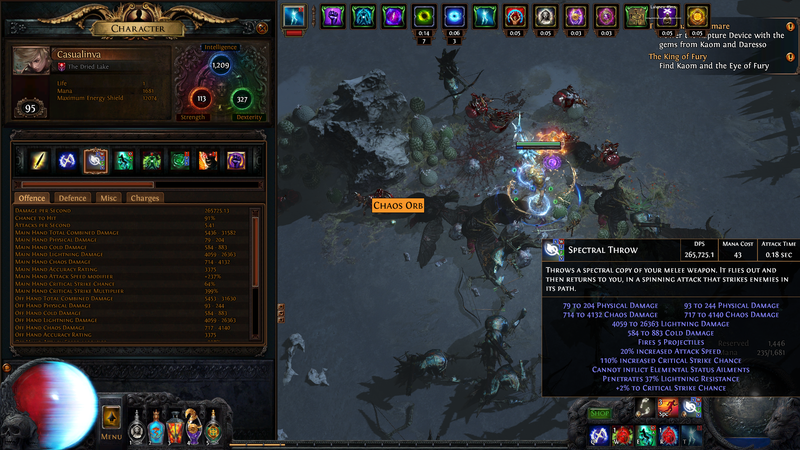 Also, when you see ele reflect rares, don't build up BF stacks on them. Just attack them with individual isolated stacks of BF so you take less damage from reflect each time and can leech back on your subsequent hits. Alternatively, if your DPS is high enough (if you have enough INT for example), there isn't even a need to use Wrath. You can just use Herald of Thunder/Arctic Armour and use Purity of Lightning. 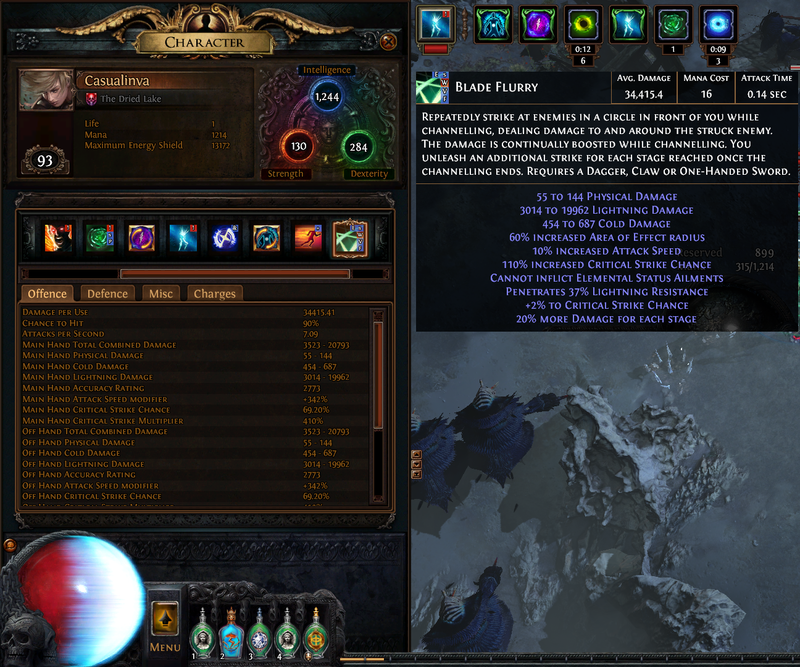 See the different aura/buff set up section below. These were the stats for 2.5. The DPS figures will be alot higher now after the crit buffs to the claw nodes. But wait, if you think these DPS figures are good, remember that an inquisitor's tooltip dps will still be better simply because of the extra gem slot (inquisitors won't have to reply on the lightning pen gem). 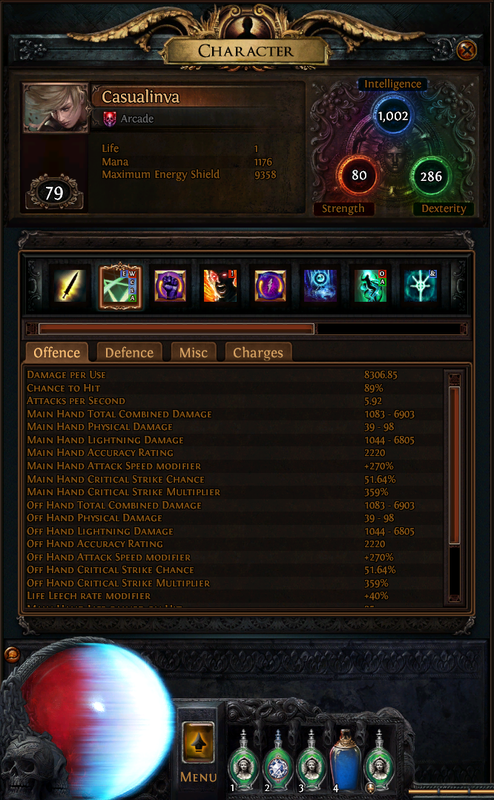 Inquisitors also get to have extra 100% crit chance/45% crit multi which does not reflect on their tooltip DPS. HOWEVER, Raider's elemental status immunity is a huge plus. At the end of the day, it depends on which one gives you a higher fun factor, and I suspect that for most players, the answer to that will be raider. Note: Gear and jewels are as shown in the gear section and are identical to what I use for BF. Most of my jewels are BF-oriented rather than ST-oriented (melee modifiers on them do not benefit ST), hence the potential DPS can still be higher than that displayed. 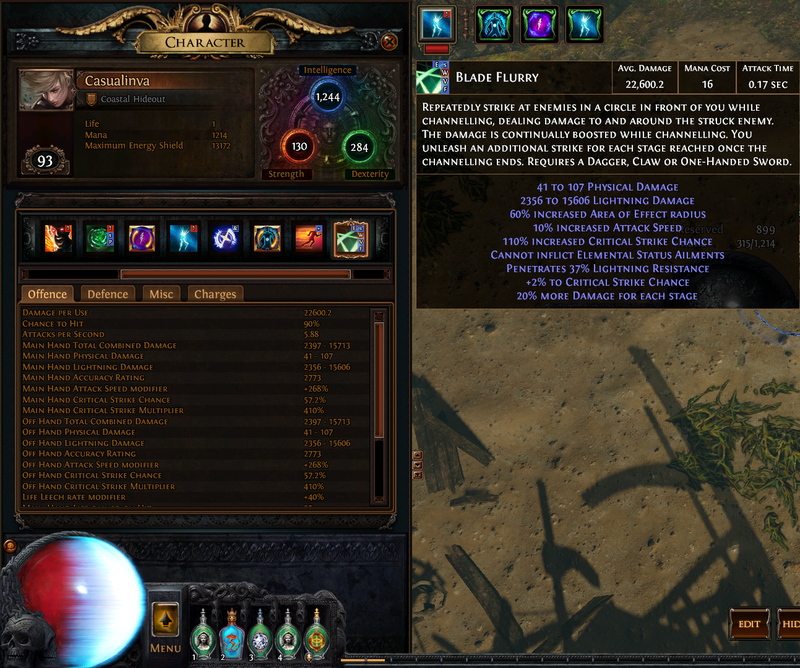 Take note that Diamond Flask also provides an extra boost of approximately 60k DPS which isn't reflected in the tooltip. Cruel: Help Kraityn for +8% attack speed or kill all to get an extra passive skill point. Up to you. Fertile Mind x 2 --> Placed at the sockets to the right of and above Ranger. There is also an option for a 3rd Fertile Mind (only for ST) at the extreme right of the tree above Acrobatics which may be better than a rare jewel if you have below 1k INT. 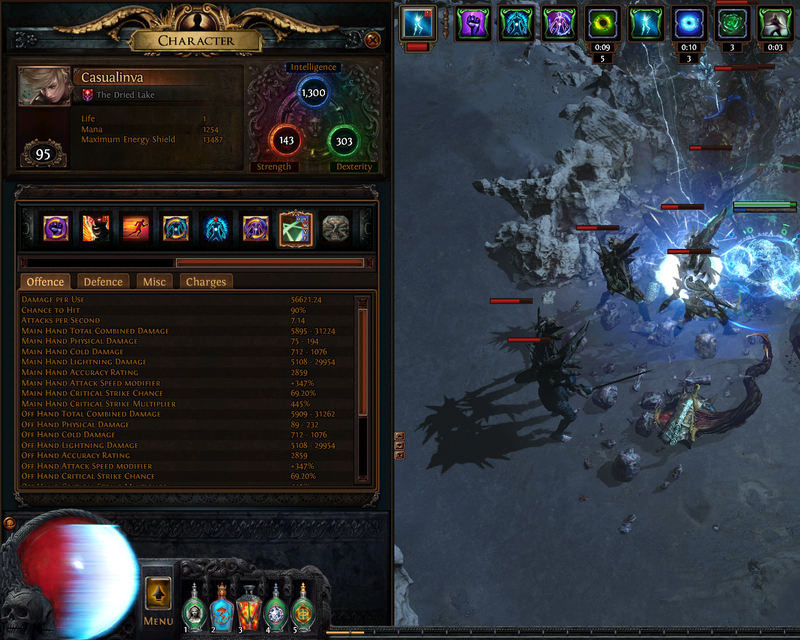 We will be using elemental overload while leveling as it is simply too huge a damage boost early on in the game. We will respec out of it eventually when we attain enough crit nodes + crit multiplier gear to make crit more worthwhile. 36 Points You'll find Static Electricity > Fertile Mind prior to HoWA. Once your ES exceeds 10k, you have good rare jewels and wish for more DPS, you may want to aim for one of the options below. If you're in HC, you may wish to stick to the option above. 38 Points You'll find Static Electricity > Fertile Mind prior to HoWA. Once your ES exceeds 10k, you have good rare jewels and wish for more DPS, you may want to aim for the tree below. If you're in HC, you may wish to stick to the option above. If you are able to obtain enough accuracy: ie. have 91-92% hit chance, you can afford to drop Acuity and the below tree will give you higher effective DPS. Try to obtain 2 pieces of gear with 250+ accuracy on them. With the bonuses from the tree/dex/golem, that will give you >2.5k accuracy which will be enough to give you at least 88-90% chance to hit vs level 84 monsters. Note: if you are playing ST, do not get jewels with melee critical strike multiplier/melee/area damage. They will not apply to ST as it is not a melee skill. They only apply to BF. 1 x Silver Flask and 1 x Basalt Flask --> 1 x staunching, 1 x warding. (because even though we don't have Avatar of the Chase, we want Onslaught!). Dying Sun is also nice to have if you want faster map clear speed. This version is recommended if you want more protection versus reflect. Your DPS will fall by about 5% but you will then get approx 23% reduced damage from reflect due to the 4% incr. maximum lightning resistance and the loss in your DPS. - Get a level 20 HoT with 23% quality - way cheaper than a level 21 HoT and provides higher DPS. - You will need a Level 3 Enlighten to pull this off comfortably. - You will lose 2 gem sockets due to the need for HoT + Enlighten. This version is recommended if you are already doing alot of DPS but want more protection against phys damage and reflect. Your DPS will fall by about 12% (compared to the Wrath version) but you will also get >40% reduced damage from reflect (compared to the Wrath version). Late game: Blade Flurry - WED - Incr AOE - Lightning Pen - Incr. Crit Strikes - Elemental Focus/Incr. Crit Dmg (Elemental Focus will give you more effective DPS, but ICD is recommended if you want to inflict those satisfying status ailments on mobs. Swap out Incr. AOE for Conc. Effect versus major high HP bosses. Late game: ST - WED - GMP - Lightning Pen - Incr. Crit Strikes - Elemental Focus/Incr. Crit Dmg (Elemental Focus will give you more effective DPS, but ICD is recommended if you want to inflict those satisfying status ailments on mobs. Swap out GMP for Slower Projectiles versus major high HP bosses. The difficult part of this build is actually being able to progress through the earlier levels. If you can get through that you'll do fine. At this stage, ES gear is weak, so I would recommend you to stack Evasion, resistances and HP to improve your survivability. Main objective here is to survive till late game where you can equip good ES gear. Weapon-wise, between level 1 - level 22 just use any decent bow and level first with Poison Arrow, then with Lighting Arrow + LMP. Once you get to level 22, you can equip your HoTA Blinders and go ham with BF. Skelly Brotem (Spell Totem + Summon Skeletons) will be your best friend. This spell summons a totem which will summon skeletons around enemy monsters, thus shifting aggro away from you and working better than Decoy Totem as the Totem itself survives longer due to lack of aggro towards it. This is pretty much the same in most AARPGs. You will be weak early on. Your key to defeating the bosses will be to kite them. Whirling blades through to get the fortify buff, go ham on BF, whirl through them/other mobs again when the boss turns towards you so as to dodge and to refresh the fortify buff. Rinse and Repeat. Against elemental bosses such as Merv and Vaal, stack resist rings. Versus Merv, get cold resists. Versus Vaal, get Lightning Resists and dodge his slamhammer (very important). Only once you have enough decent ES gear and when you feel that chaos damage is starting to become a problem for yourself. You want at least 4.5-5k ES once you have respecced into CI to feel slightly comfortable. update: build is coming along decently. ignore the mana flask. just a placeholder before i get vinktars when they hopefully drop in price a little. no mana issues. not even using astramentis because they are way too inflated at the moment. 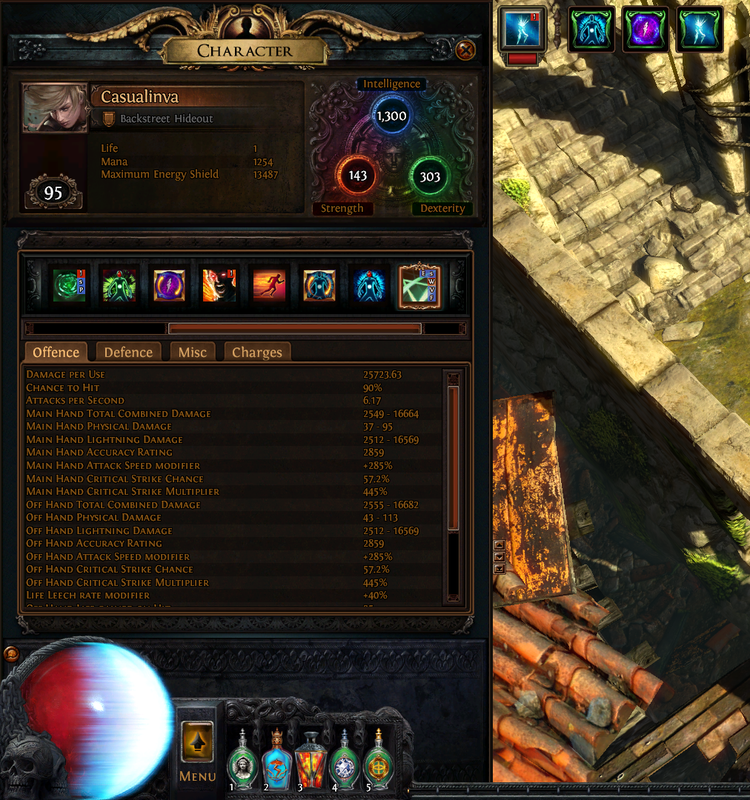 screen shot shows the average damage with 4 frenzy charges and 3 power charges up. haven't done uber lab yet to get the last 2 ascendancy points. 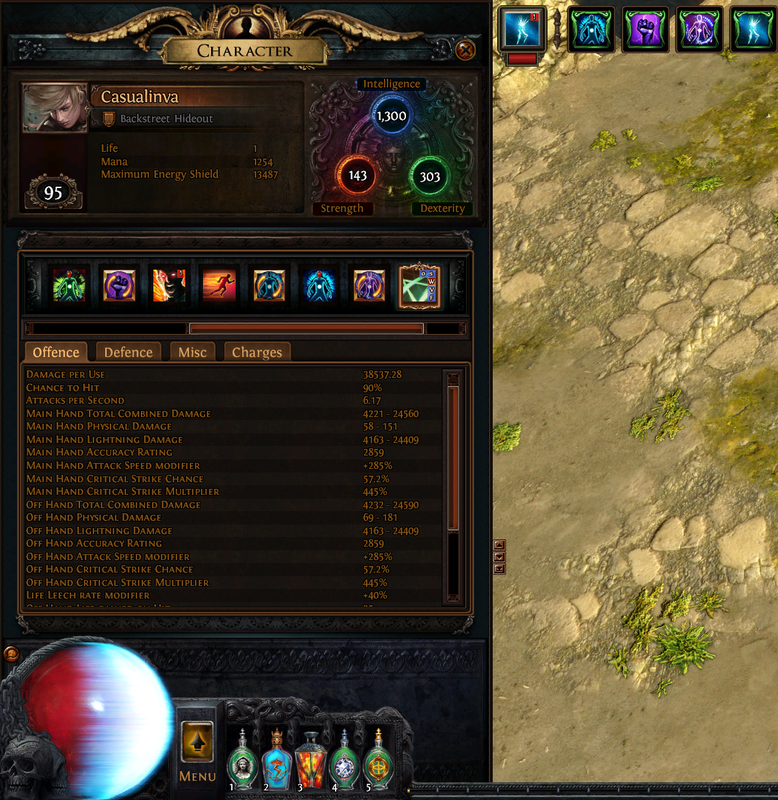 still only level 79 so will have plenty more points to spec into DPS. haha I may just take some of those frenzy charges after all! still min-maxing my build as we speak. My projected end tree at this point doesn't reflect any extra frenzy charges because based on my current gem links (shown), %ele dmg will result in a higher average damage than frenzy charges. However, I may be changing the tree slightly as I am going to remove faster attacks from my links to add a different gem, and I'll be needing some extra frenzy charges to maintain my APS while achieving higher avg dmg. Jewels I will only be taking if i can find good enough jewels, then I will alter accordingly. Getting more jewels just to improve INT imo isn't worth it because it provides diminishing returns the higher u go. I think an INT range of 900-1000 is just about optimum for both def and off capabilities. any higher and ur DPS will suffer, any lower and ur ES sufers. ignore the random gems from other pieces of gear, still trying to get vaal discipline so that i can link it with CWDT, as well as some other gems. for now im just leveling a bunch of gems for future experimentation/optimisation. fleshed out the guide. 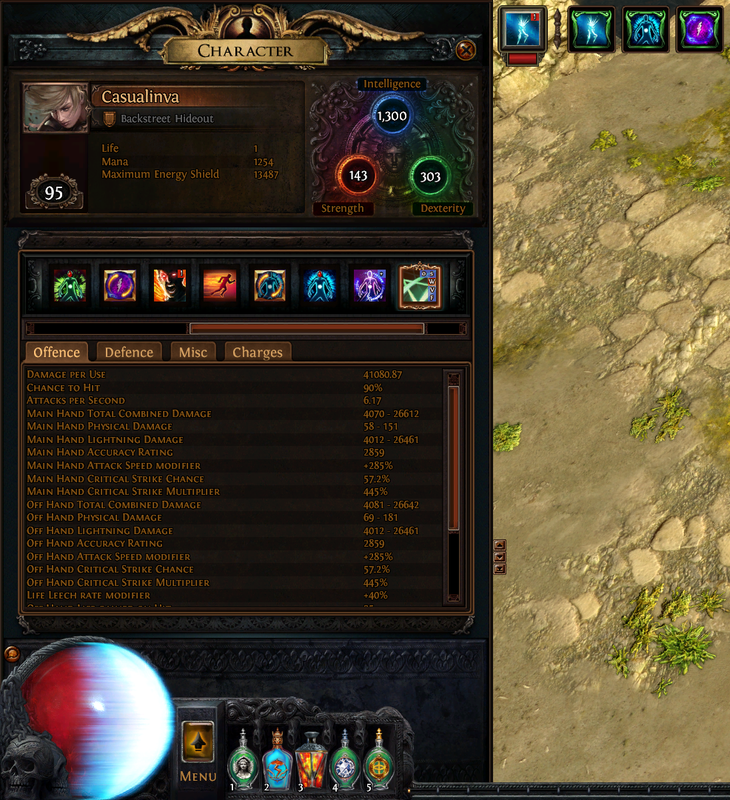 still leveling char, hope to provide more stats soon! It's good to see your name back in the forums! Do you mind setting your profile as public to check the evolution of your char without havin to wait for a thread update? Haha yes it's me :p thanks guys! Oh I didn't realize my character tab was set to private. Coulda sworn I made it public a coupe of years ago. Changed! -jewel are pretty strong, why not take them? because you have no good ones? -and i dont get why you chose Blast Radius?!?!?!? 1. If you read carefully, you'll realize that the tree I provided is purely a skeleton tree. How you progress from there is up to u, i.e. Whether to grab more frenzy charges or jewel slots is your choice. Extra frenzy charges provide 7% attack speed, 3% attack damage and 4% more damage, but 2 points to grab that isn't necessarily better than 2 points to grab a well modded jewel. 3. Elemental overload is overrated. It is easy to grab because it makes building the tree easier, but it isn't more powerful than a crit build that is built well. You don't need gear to go crit-based. Just gems and a good tree. Crit mods on gear are of course a bonus but not necessarily. 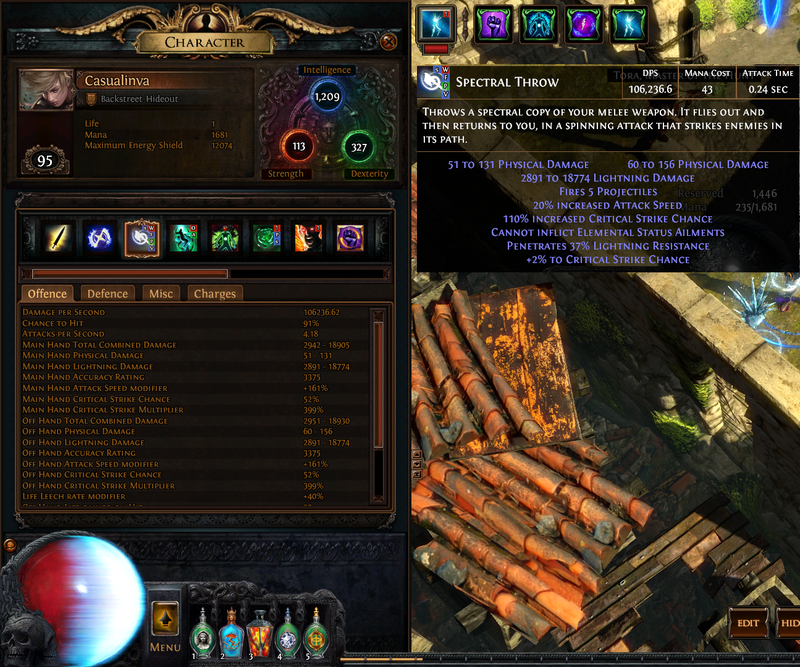 More importantly, by not going elemental overload, you don't render crit mods on gear useless to yourself. 4. 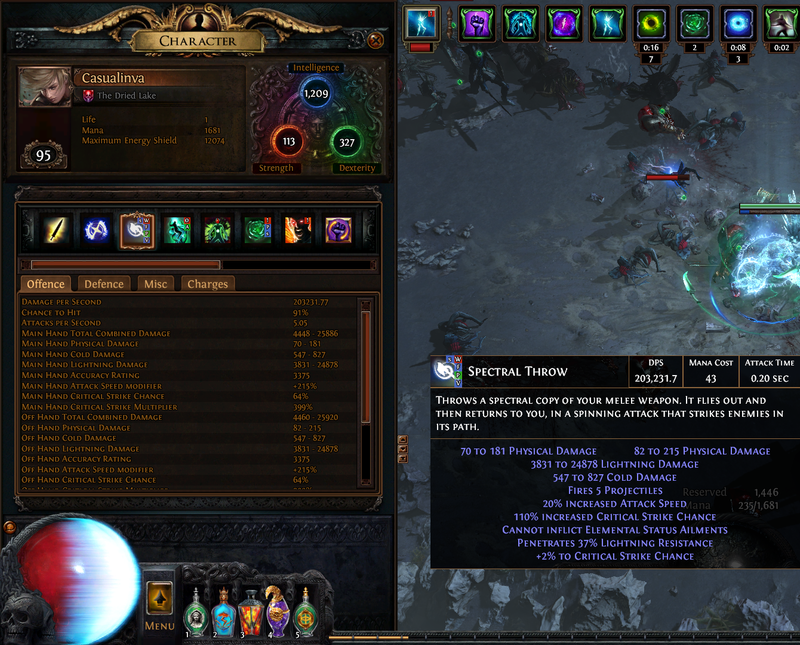 Bro this is blade flurry not spectral throw. In other news, I'll probably be changing the tree a little. After some calculations I've decided that the pathing inner rather than outer is marginally stronger defensively and offers slightly more versatility.